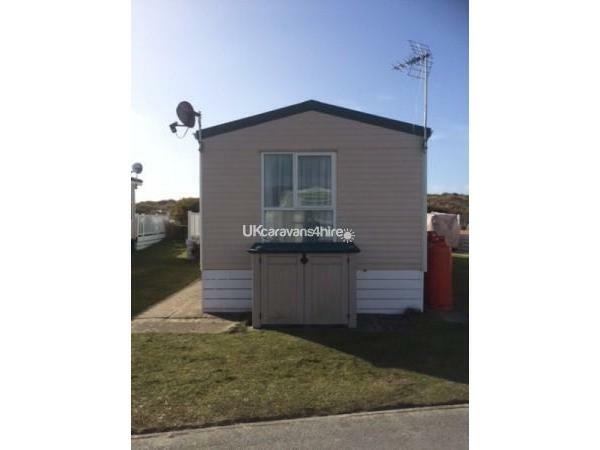 A lovely two bedroom Winchester caravan situated on Sands Lane in the popular North Wales holiday Park, Greenacres. Sands Lane has a very limited holiday occupancy and is one of the Top prestige locations ( if not the No 1 ) on the park , Minutes away from Black Rock Sands beach with beautiful views of the Llyn Peninsular and the Snowdonia National Park. There is plenty of space around the Caravan " 4 cars " with decking and a lovely child friendly garden ( Rabbits often frequent the lawn ) . 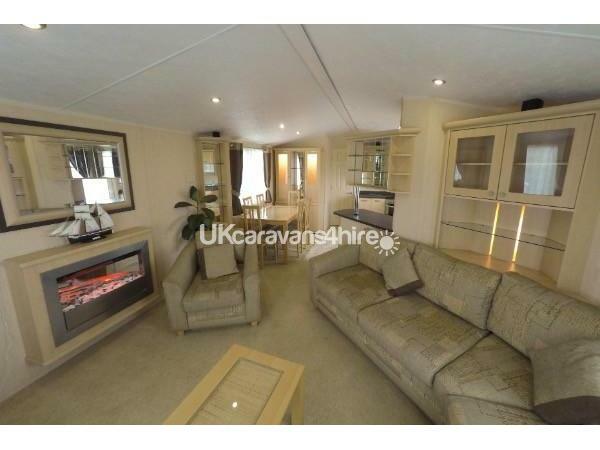 There is central heating throughout the caravan and an electric fire in the lounge. 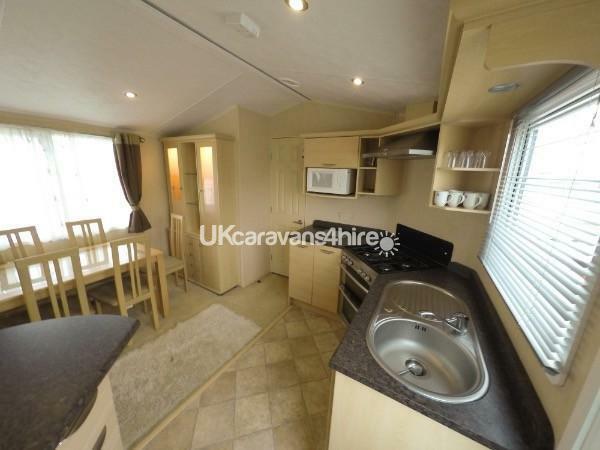 The caravan is fitted out with high quality fixtures and fittings. The main bedroom has Queen size bed with under bed storage, walk in wardrobe, TV, bedside table, and mirror and over bed storage. 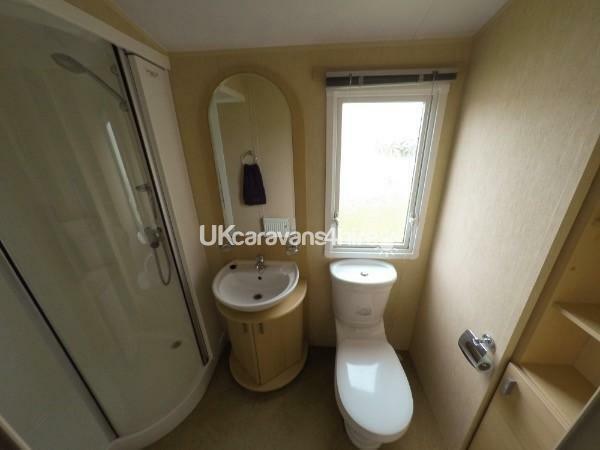 The main bedroom is en-suite and has a toilet and basin. 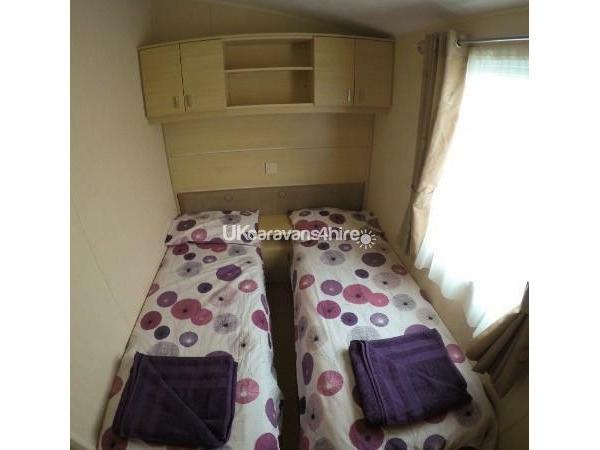 The second bedroom consists of two single caravan size beds, a wardrobe, and radiator and over bed storage. The kitchen has a full size oven, hob and extractor; fridge/ freezer, microwave, kettle, toaster and plenty of crockery and cutlery to cater for up to 6 people. 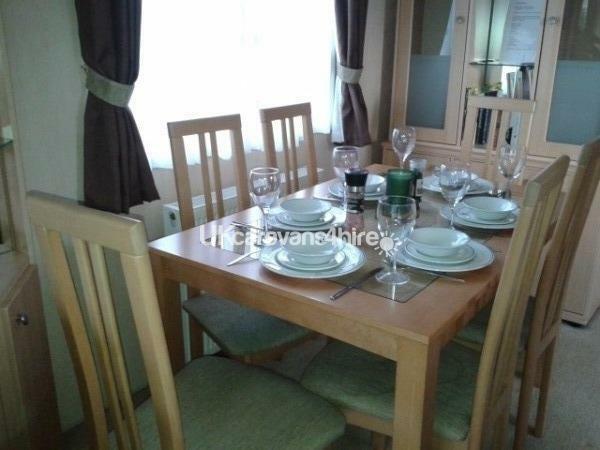 The dining area has a table and seating for up to six people. 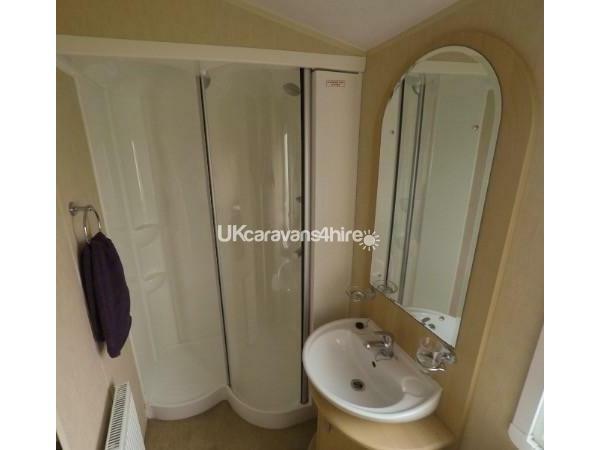 The Shower room consists of a large walk in shower, basin, mirror, shelving and a toilet. The lounge has an electric fire, TV and DVD player with surround sound home theater, freeview, mirror, coffee table and plenty of seating for up to 6 people. The sofa can turn into a sofa bed to sleep an extra two people. Customers need to bring there own Linen & Towels,, however Duvet & Pillows provided. Outdoor furniture and a stand up charcoal BBQ will be provided, and parking is available at the rear and side of the caravan. Smoking and pets are not permitted in the caravan. Greenacres holiday park provides entertainment for the whole family and includes kids club, Funstars, an indoor heated pool, outdoor splash zone, crazy golf, archery, fencing, Funworks amusement, laundry, bike hire and learn to ride, pool tables, soft play areas, food and drink facilities Take Away, convenience store and much more. It is important to note that fun-works passes are not included in the cost of hire and you will need to be purchase passes from Greenacres reception. Prices vary on the number of nights and time of year. Passes are needed to access all entertainment and eating/drinking facilities. However you can access the convenience shop, launderette, and takeaway fish and chip shop without a pass. A 20% non-refundable deposit is required within 7 days to secure your booking and the remaining balance is required 6 weeks before your stay. If holiday is booked 6 weeks before arrival, full amount is required. A refundable £75 deposit will need to be paid at the time of booking and will be refunded once the caravan has been checked for damage/extra cleaning and returned within 2-10 days after your departure. 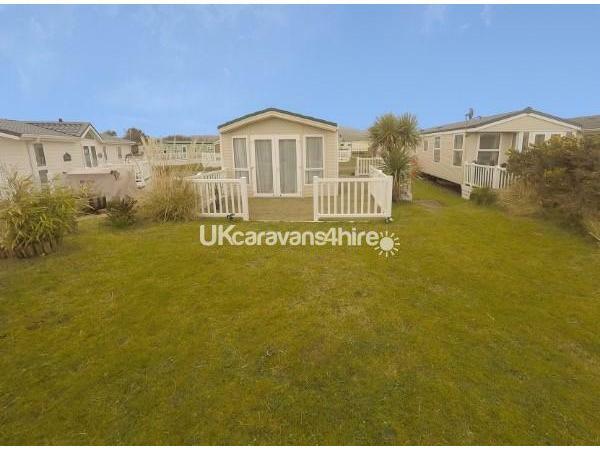 We had a very pleasant stay in this very well situated comfy caravan right by the sand dunes. Our experience from start to finish was made a lot easier by David, the owner, being so professional and attentive. 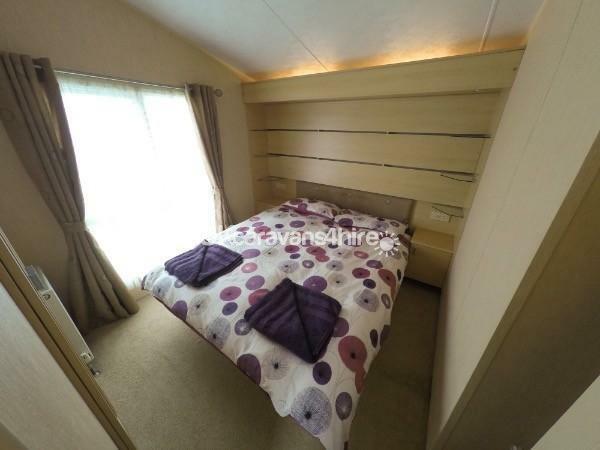 We would definitely recommend this caravan and we would love to come back again. This van is in a prime position not overlooked, just great views of the dunes, very close to the beach. It was beautifully clean and well equipped. David’s communications to us were timely and accurate. He took care to ensure we had information about the area and this made such a difference to us as we hadn’t been to Porthmadog before. We will be back! Thank you David! We stopped in this lovely comfortable caravan, excellent location near the beach and only a short walk to the main complex. The owner has kept in touch regularly from our booking to returning home. We enjoyed the private garden and the tranquility of sitting there relaxing. We would be very happy to return at a later date. The caravan was fab (with walk in wardrobe in master), clean with all bits and bobs you need, in a great quiet location with a private garden backing onto the sand dunes - it was great sitting there in the evenings watching the visiting rabbits which my young daughter loved. David's communication was excellent throughout with very clear instructions to make the visit go smoothly and returned the deposit unprompted. I would definitely stay again and fully recommend the caravan and David. Just had a wonderful relaxing holiday at greenacres. Caravan was very nice and comfortable, the garden was a bonus, we eat out every night watching the sun go down, looking at the surrounding mountains. Location is perfect for beach walks. Lovely peaceful area. Thank you Dave for allowing us to share your lovely caravan and 10 out of 10 customer service. Will definitely go again. Booked this last minute and how glad were we. 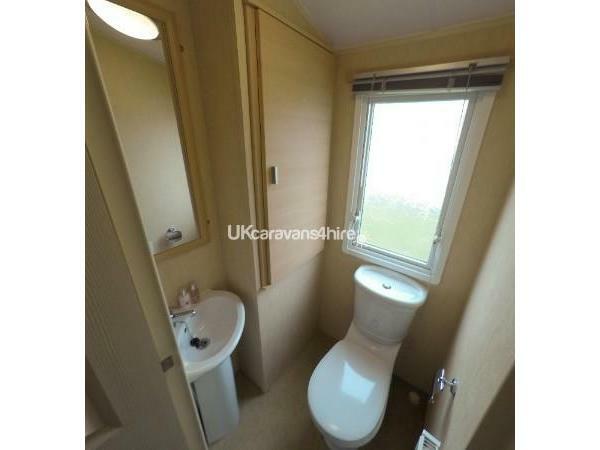 Beautiful caravan, immaculate condition in a beautiful , quiet part of the park. The patio area with bbq and private garden overlooking sand dunes with mountain view was an added bonus. We have stayed in Greenacres on many occasions but this was the best caravan we have ever stayed in. We were sorry it was only for 5 days as could've have stayed so much longer. Will definitely rebook when it's next available, David was fantastic, very helpful and didn't even mind when I took one of his pillows home by mistake! Oops. David I owe you a pillow. Can't wait to return. Thank you David , we had a fabulous time. Have visited Greenacres site on many occasions and this caravan has to be the best we've ever stopped in. 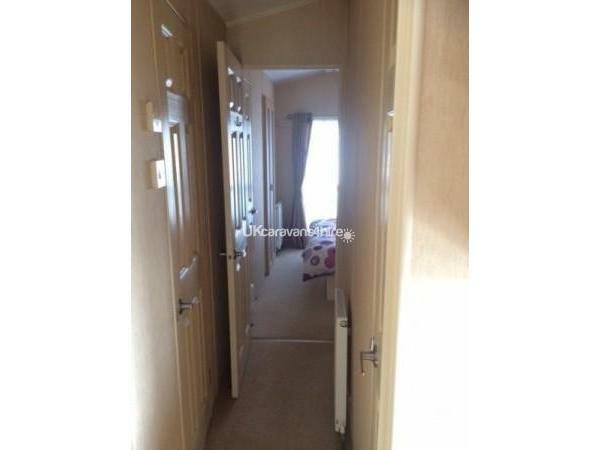 Clean and tidy in an excellent location literally 2 minutes from beach. David was great throughout from booking to making sure we'd arrived ok and everything was okay with caravan. We had a fantastic week and will definitely be booking again next year. Can't praise enough. Thank you. Stayed here with my daughter and my elderly parents, absolutely fabulous holiday, could not fault it, caravan is beautiful and clean and tidy when we arrived, the location is fantastic with stunning views of the mountains and sand dunes with a beautiful front private garden for sitting out and appreciating the views, also a very quiet location, next to the beach and 5 mins walk to the complex. Communication with David the owner was fantastic, if we needed anything he was always a call away 24 7 and nothing was any trouble. Definitely going to book again and would recommend this caravan for a great holiday. Thanku again David. Just come back from a wonderful short break here. 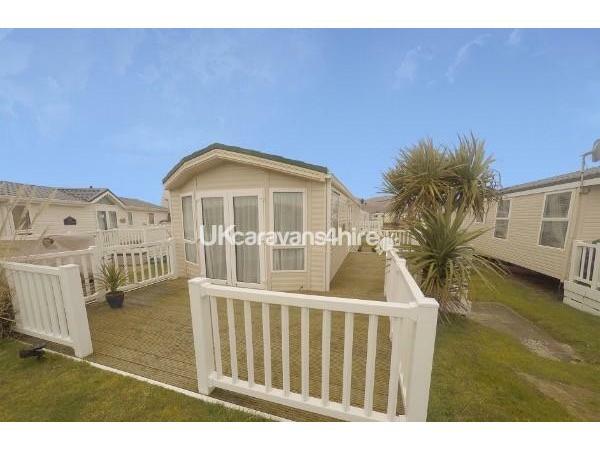 The caravan was beautiful and in a wonderful position overlooking the sand dunes with a lovely private little garden. The owner David was a very pleasant man to deal with and did everything to ensure we had a wonderful holiday. Would not hesitate to return here time and time again. Will be rebooking for next year very shortly.